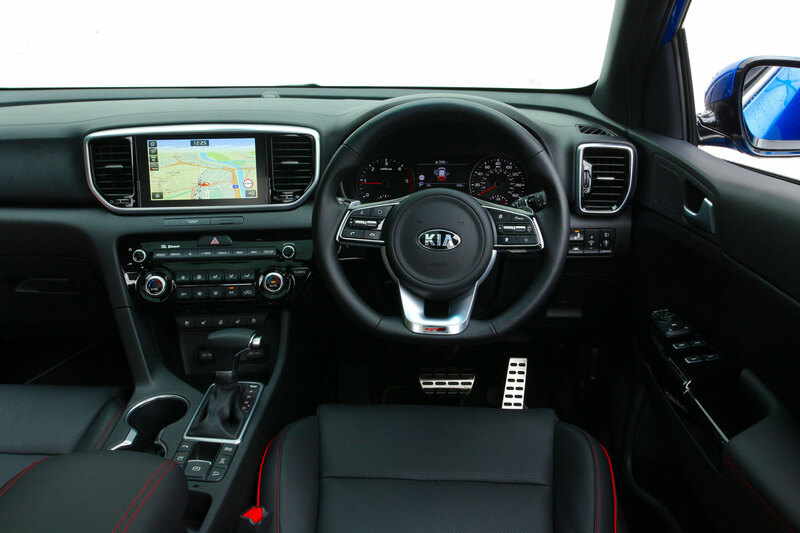 KIA, the highly successful South Korean marque, produces around 2 million cars a year globally. A huge reach for this award-winning motor company boasting a manufacturing pedigree stretching back to 1944. 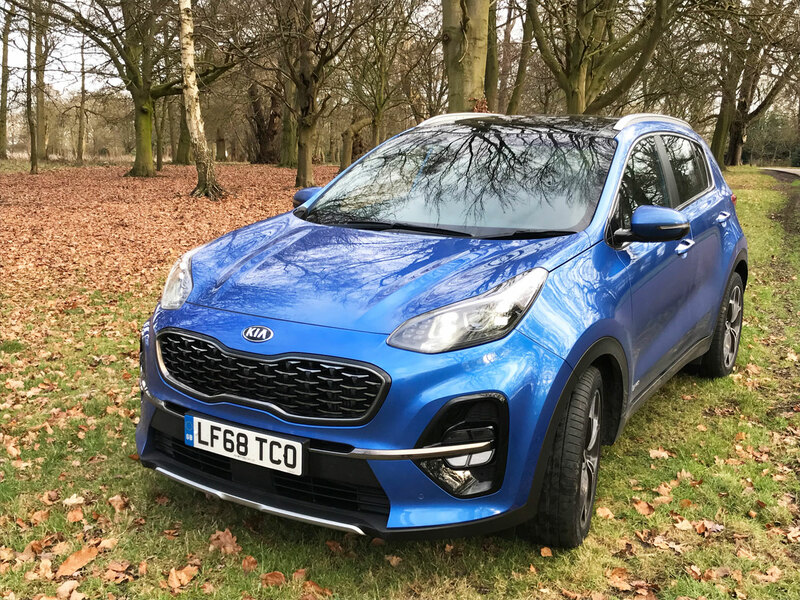 A subsidiary of the Hyundai-KIA Automotive Group, seventy-five years of progress and innovation have resulted in classics such as the Rio, the new Stinger (which I’ll be testing soon) and KIA’s popular mid-range SUV, the Sportage. Manufactured at KIA’s European facility in Žilina, Slovakia, the five-millionth Sportage was produced in March 2018. 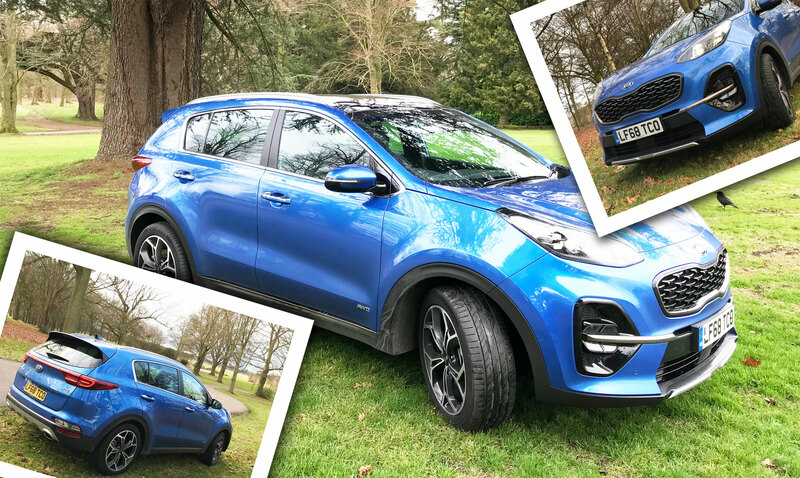 The KIA Sportage is the company’s best-selling model in the UK (40,000 sold in 2018) and after driving the new 4th generation Sportage 2.0-litre GT-Line S for a week I can see why the marque’s award-winning features have garnered such a loyal fan base. Aesthetically KIA’s Frankfurt-based design team have created a sportier, sleeker Sportage than previous iterations. A commanding presence with muscular haunches, high wheel arches and sleek high shoulder line, following the curve of her roof rails to the rear window sun visor. She’s also a few mm longer. Re-designed sporty 19” alloys, gloss black ‘blade’ mesh radiator grille, dual exhaust in a shiny trim; and new dark chrome inserts on the front bumper and side sills make for an eye-catching exterior. Prefer to go incognito in the rear seat? KIA Sportage GT-Line S has privacy glass on the rear windows and tailgate. The new lights are efficient and eye-catching: front fog lamp housings as well as a set of full-LED headlights with four-point daytime running lights. At the rear the new look includes a C-shape LED light, while the reversing lamp is cleverly built into the rear bumper – with a sporty splash of chrome on the base. Exterior aesthetics can cover a multitude of sins inside the cabin, but the Sportage’s interior is smart, user-friendly and intelligently designed. Leather features highly in the Sportage GT-Line S: sleek, comfortable front seats embellished with sporty red piping and stitching. 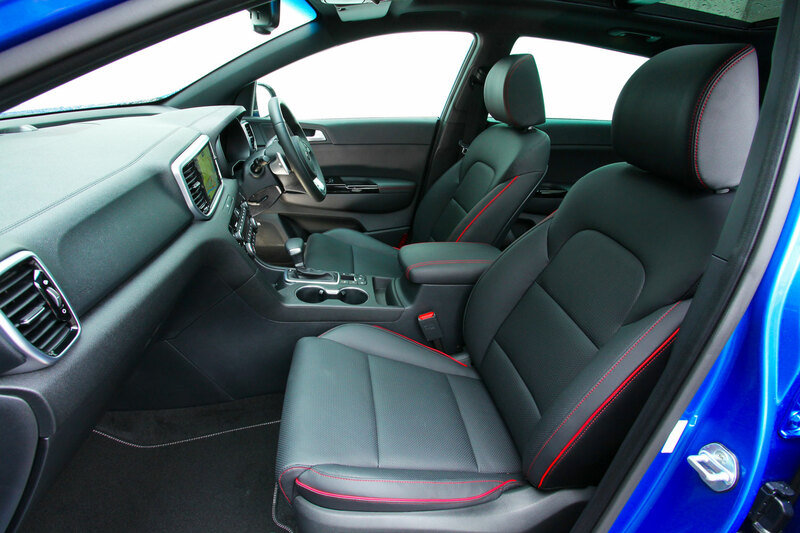 The rear seats, also leather, have integrated adjustable headrests. Driving in comfort is more important to me (and most women) than style. We want the ability to see over the hood. We want 360-degree vision. And we don’t want to stretch to reach either pedals or steering wheel. The Sportage ticks all the boxes here. As a shorty, I love the power-adjustable driver’s seat: Ten ways to recline, slide and elevate. There’s also good lumbar support – essential for a long drive to Dorset during the test. But the most pleasing feature for me? The heated front seats, which are especially welcome during winter’s snowy arrival this week. In summer, drivers can make use of the ventilated option. 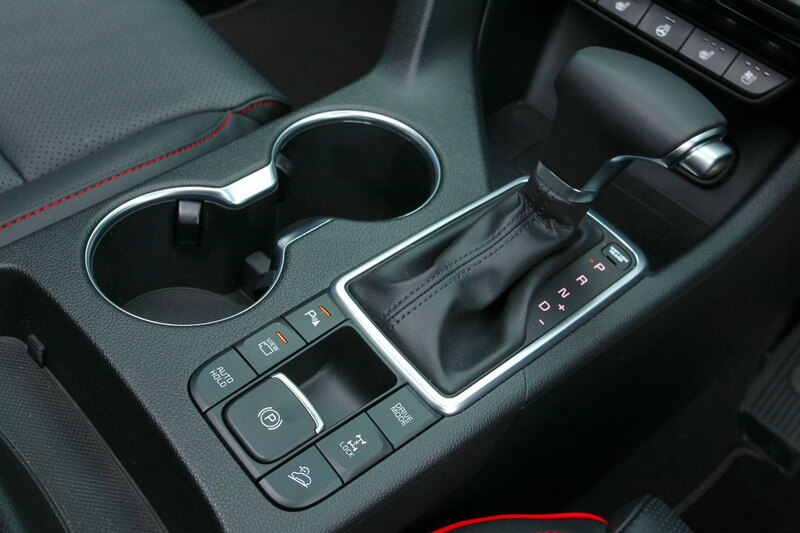 The heating/cooling controls have snazzy bezels around the dials, and the leather adjustable steering wheel has been redesigned into a D-shape with perforated inserts and the GT-Line logo and is both comfortable and user-friendly. All-around visibility in the Sportage is excellent. 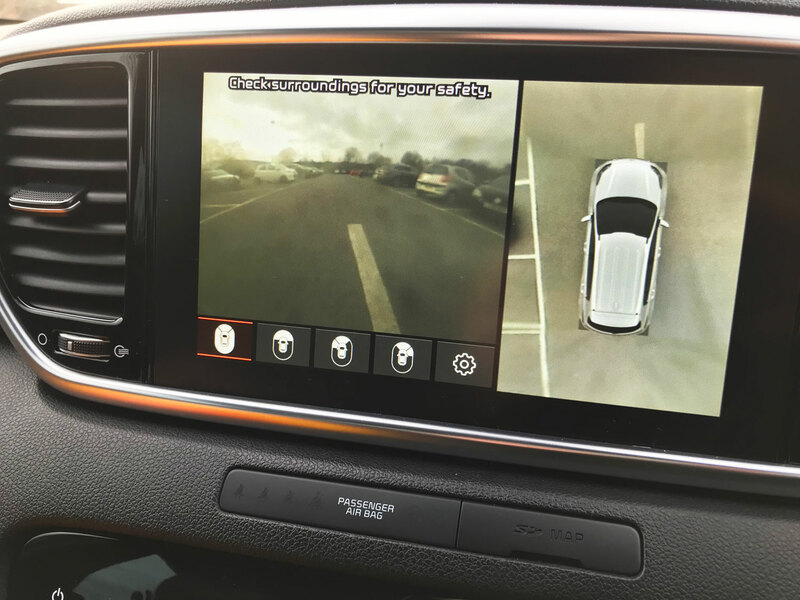 And there are no blind spots when parking, thanks to the nifty 360-degree around-view monitor which makes reversing a breeze. The panoramic one-touch sunroof opens the cabin roof and glass in a single slick movement. Not a feature I used much in this grotty weather, but sliding back the black screen brought extra light into the cabin on a dark winter day. I felt blissfully cocooned in warm, dry comfort on the long motorway drive, accompanied by an excellent 8-speaker JBL sound system and DAB radio. As you’d expect, Apple CarPlay and Android Auto are standard and there are USB charging ports in both front and rear cabins. Insulation is such in the Sportage GT-Line S that at speeds the diesel engine and outside noise barely registers. The dash controls are all within easy reach and thoughtfully the 8-inch infotainment panel is tilted at a 70-degree angle – for safety and ease of viewing. In the front cabin, the passenger door is equipped with an additional satin chrome grip handle which is useful for less mobile occupants as my 85-year-old father happily discovered. And I like the 2-cup holders that are large enough for 1-litre bottles. I enjoyed the smooth 8-speed automatic gears (paddles available for purists) and the Sportage GT-Line S moves through the ratios cleanly and smoothly.